Prepare the grill on high heat for direct cooking. In a small saucepan over moderate heat, melt the butter. Then add the garlic and chili flakes. Cook until the mixture is fragrant, switch the heat to high and add some lemon juice, then toss in the parsley and season with salt and pepper. Brush the crab legs with some oil, and grill over high heat for about 3 to 4 minutes on each side. Remove the crab legs from the grill and place them into a large mixing bowl. 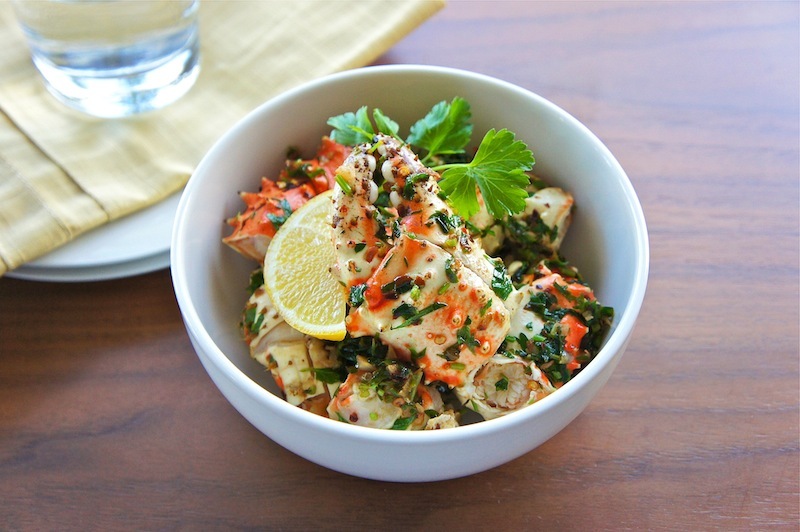 Toss the garlic butter sauce over the crab legs, mix well with a tong, and serve immediately. Many's the time I've considered buying some crab legs. But I confess to being intimidated by them. I'd have to do them on the stove or in the oven. I suppose the broiler could work? Yes, I'm sure the broiler would work too.